The news that seventeen schools in Edinburgh have been closed as a result of structural defects http://www.bbc.co.uk/news/uk-scotland-36009564 comes as no surprise to me given that the Private Finance Initiative (PFI) / Public – Private Partnership (PPP) under which they were constructed was a conceptual disaster from the outset. The traditional approach to procuring a building involves establishing a brief, selecting the best design to meet the brief and then identifying the builder. In PFI the process is more or less reversed. Private sector consortia finance, design, build and operate projects through long term concessions in return for a regular income stream over the life of the concession. Bids are evaluated primarily on price. The architectural input is often minimal by architects selected for their low fees alone and the role of the architect on site is removed to cut costs with the ‘architecture’ consisting of meeting the brief at the lowest cost leading to a kind of PFI aesthetic – cheap, ‘boxy’, bland. It shouldn’t be like this. Creating good buildings is a primary cultural act. It is too important to be the secondary outcome of a complex financial and contractual process that places insufficient emphasis on high quality design and construction. I don’t know more than is in the press about the Edinburgh case but it simply isn’t possible to overlook something as fundamental as external cavity wall ties and internal masonry wall head ties. It looks like a clear cut case of ‘cutting corners’ in a hidden area where the saving will not be detected (until a wall falls down and kills someone). No doubt some of those responsible for the defects in the Edinburgh schools will be called to account but the politicians, bankers, investors, lawyers and bean counters who dreamt up this defective ‘back to front’ way of building won’t be amongst them. I’ve just changed my accountant from a reputable ‘traditional’ accountancy firm to an accountant some distance away who will access all my data via an online ‘cloud hosted’ software package. I should have done it years ago and saved the money that this approach allows. It’s not just accountancy that is facing technological change. The practice of architecture has changed enormously in the years that I’ve been in the profession. When I first came to London in the 1980’s the big offices who handled the big jobs were for the most part based in the West End. So were the structural engineers, building services engineers and quantity surveyors as well as many of the clients. I worked on one big project where we alternated the design team meetings between the team members (rather than at the architect’s office) as all were within walking distance. The big offices carried out the big jobs because they had sufficient numbers of technical staff to complete the technical design stage which is the labour intensive part of any project. Big offices also had their own prized office specifications and large ‘hard copy’ technical libraries with at least one full time librarian. This all changed on account of architectural computing. Desktop computers have so much power and save so much time (especially when it comes to repetition or making changes) that they did away with the need for large teams allowing small practices to carry out large projects. The online national building specification did away with specifications that were the property of one practice and online technical data did away with ‘hard copy’ technical libraries which are often frowned upon nowadays as they are likely to carry out of date material. Location is no longer a factor either in winning work. With emails and online communications project design teams can be assembled from all over the UK. In my practice it is sufficient simply to be within a train ride of central London and within a short drive of the M25. The good news for clients is that constant competitive pressure has ensured that the efficiencies brought about by technological change have all been passed on to clients in the form of reduced fees and I expect my saved accountancy fees to be reflected in my own fees as a reduced overhead. It’s excruciating to watch government ministers squirming in order not to state the obvious and what they believe with regard to the future of the Tata steel making plant in Port Talbot which is that there is no long term prospect of the profitable manufacture of bulk steel in the UK. It may be possible for the government to offer short term support and even broker a deal with a buyer leading on to long term support in the form of training and support for new businesses but Tata is a private company which, having done its sums, is reportedly prepared to give the blast furnaces away. Tragic though it is for the steel workers, their families and the communities whose lives depend on the Port Talbot plant the future of steelmaking in the UK must be in speciality steels and the specialised rolling and milling of already-manufactured steel. Take a look at the automotive industry in the UK. When the infamous government owned British Leyland motor company fell apart from the 1970’s onwards it was generally held to be the end for the industry in the UK but this turned out not to be the case. By concentrating on adding value in niche markets and specialisation it became what is now a thriving industrial sector known for premium and sports cars (as well as volume production). It is a centre of excellence for engine manufacturing and motor sports. So let’s be realistic about the present circumstances and plan for a bright ‘value added’ future for steelmaking in the UK. The question of what to do on a wet Easter Saturday with the family visiting was solved by a one hour drive and an afternoon at the ‘Watts Gallery – Artists’ Village’ in the village of Compton near Guildford www.wattsgallery.org.uk. The Victorian painter and sculptor George Frederick Watts and his artist wife Mary Fraser-Tytler built their house ’Limnerslease’ in Compton in 1891 as a retreat from London. The part of the house that Watts used as his studio has recently been opened as the Watts Studios – a new extension to the Watts Gallery. The project is featured in this month’s RIBA Journal so I was looking out for the chance to make a visit. The Watts Studios is part of the group of buildings which has grown over the past 10 years into a visitor attraction. 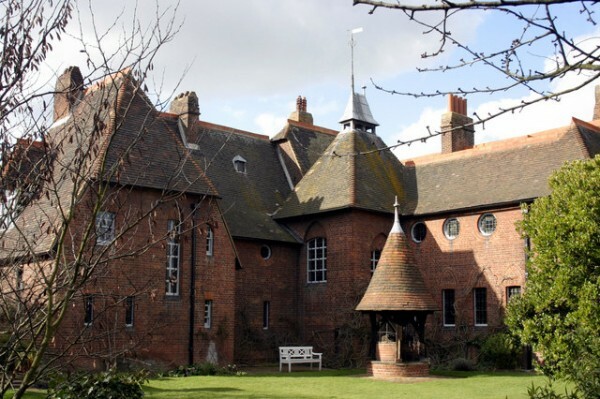 The Watts Gallery, which was originally opened in 1904, reopened in June 2011 after a major refurbishment. The site also houses an art nouveau inspired ‘arts and crafts’ chapel designed by Mary. In the Watts Studio, the large studio actually used by Watts is the main event and it was the highlight of the visit for me. It is an authentic restoration of a purpose built ‘arts and crafts’ style studio space complete with artworks, easels, brushes and all the paraphernalia of an artist so it has a ‘time capsule’ feel about it. It is a double height space overlooked from a viewing balcony with a south facing double height window to the garden (unusually Watts preferred to work in the variety of southern light rather the uniformity of northern light) and an east facing sloping roof window. The studio gives an insight into the ‘process’ of an artist. 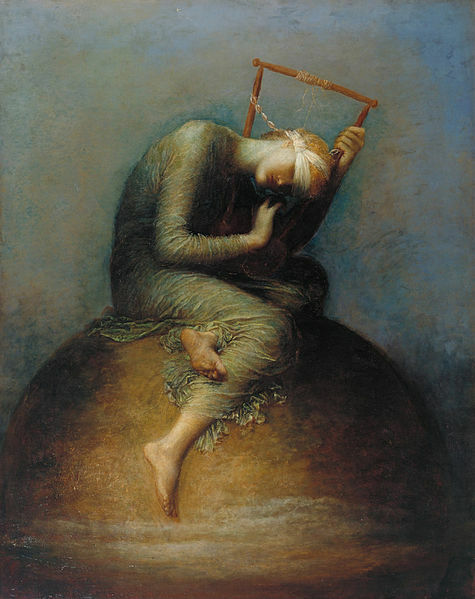 There are over 100 paintings by Watts in the Watts Gallery. Like much Victorian art Watts was at one time badly out of fashion and his allegorical, symbolic and mystical images do seem a bit weird – even spooky but that’s probably because I’m not up to speed on his spiritual ideas. The best bit of the gallery is the sculpture studio, complete with two original ‘gesso grosso’ (plaster mixed with glue and hemp) models by Watts used for the creation of bronzes. One of these is the model used for the giant bronze ‘Physical Energy’. Another insight – this time into his ‘process’ as a sculptor. The journey home included a discussion about why the painting ‘The Ghost Ship’, which hangs in the gallery, sways on its hanging wires when you approach it. Is it a draught, a pendulum effect, breath or body heat? Or is the ghostly hand of Watts still at work? 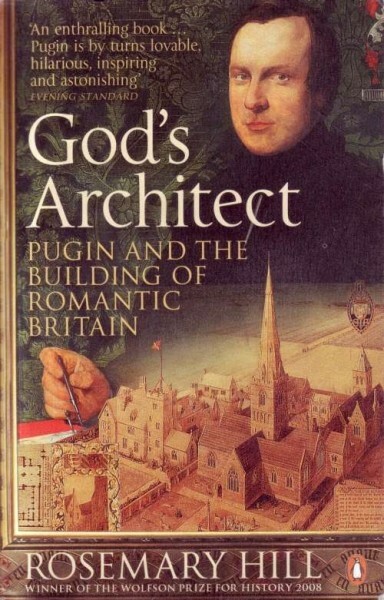 I’ve just finished Rosemary Hill’s epic biography of Augustus Pugin ‘God’s Architect – Pugin and the Building of Romantic Britain’. 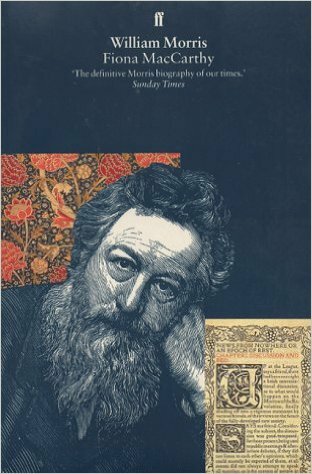 It reads a bit like a prequel to Fiona MacCarthy’s definitive biography of William Morris ‘William Morris – A Life for Our Time’ which I half finished some time ago and finally finished last year. Two absolutely marvelous books that bring two design giants of the Victorian era to life. Though they had much in common, and Morris was heavily influenced by Pugin, their paths never crossed. Morris (1834-96) was entering Oxford when Pugin (1812 – 52) died aged 40. Pugin was an artist, writer, critic and designer who pioneered the Gothic revival and packed more into his short life than most do into a long life. He was hardly out of childhood when he started his architectural career in his father’s architectural drawing school. The school travelled to measure and draw gothic architecture in France for publication in volumes of architectural drawings. So Pugin was completely immersed in the glories of late medieval gothic even before his architectural career began. He matured from the authentic copying of gothic archetypes (pointed or ‘Christian’ architecture as he called it) to a completely original free use of gothic elements applicable to all building types. 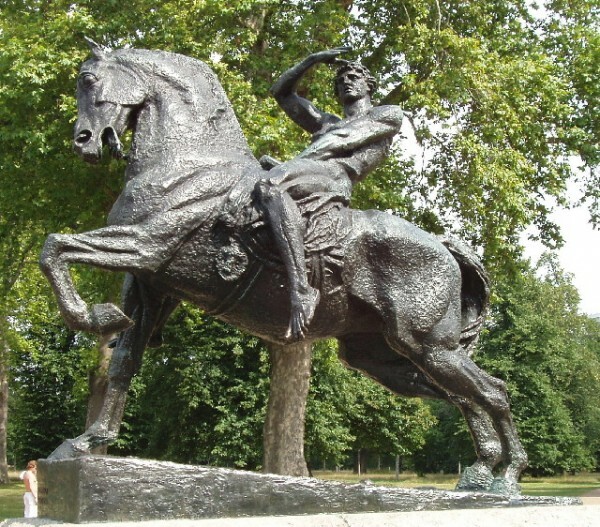 As well the design of buildings he designed interiors, furniture, stained glass, metalwork, textiles and jewellery. When I think of gothic architecture I think of cold, dark, damp gothic churches but Hill’s book brings to life the splendours of high vaults, buttresses, rose windows, towers, spires and pinnacles. Along with many fine buildings of his own Pugin is known for his work with Sir Charles Barry on the interiors for the Palace of Westminster (Houses of Parliament) and the Elizabeth Tower (Big Ben). Morris was an artist, writer, poet, designer, craftsman, publisher and socialist. Artistically he was associated with the Pre-Raphaelites and the arts and crafts movement which grew out of concerns over the effects of industrialisation on traditional skills. For Morris the arts and crafts movement was about the politics of living and working not about style. MacCarthy’s book pulls the multiple strands of his life together and shows how they led to his role as one of the founders of the socialist movement. 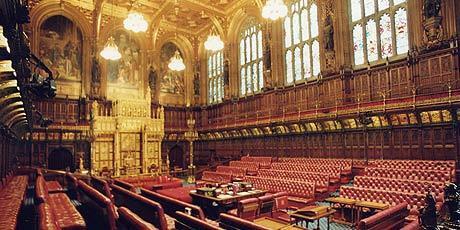 Like Pugin, Morris was a pioneer who owed much of his success to his vision, determination and sheer hard work. 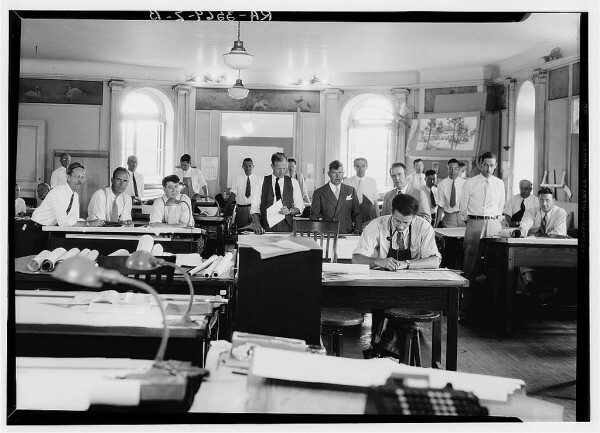 Amazingly there is much here for the practicing architect of today especially for those of us who believe that the current way of doing things is in the process of a slow disintegration that will lead to a more hand crafted world. The championing by Pugin and Morris of the practical role of the skilled artist-craftsman in terms of creativity, inventiveness and problem-solving is especially relevant to these changing times. As the realisation dawns that the current economic model, based on debt that cannot be repaid and the impossibility of an infinite supply of cheap energy and natural resources, is broken, we will see a gradual re-setting of how things get done – towards a more local, sustainable and hand crafted model. Such a model might even be recognisable to Pugin and Morris. Good news too on the sustainable energy front. In Surrey the biggest floating solar farm in Europe, which is being constructed on the Queen Elizabeth II reservoir near Walton-on-Thames, will be completed by the end of the month. More than 23,000 solar photovoltaic panels will generate the electricity equivalent to the annual consumption of about 1,800 homes http://www.bbc.co.uk/news/uk-england-london-35705345. In the Pentland Firth, Phase 1a of the world’s largest offshore tidal stream turbine project is now well underway. Eventually the full project will supply 398MW of clean and renewable electricity to the national grid. 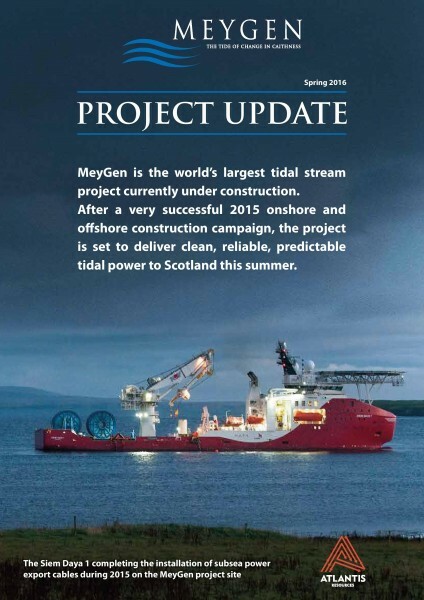 The spring 2016 project update is available here http://www.meygen.com/. The missing piece of the jigsaw is renewable energy storage. The Renewable Energy Association published its report ‘Energy Storage in the UK’ at the end of last year which provides an overview of the emerging technologies http://www.r-e-a.net/member/uk-energy-storage. Energy storage will come to the fore as renewables begin to meet an increasing part of the nation’s energy demand. Let’s hope that last December’s Paris climate deal, which signalled the beginning of the end of the fossil fuel era, also signalled the beginning of the ‘clean’ energy revolution – not the continuation or return of ‘dirty’ nuclear power. When I was asked by ‘Wealden Times’ to name a building that has been a particular inspiration and explain the choice in 150 words I had no hesitation in choosing the Glasgow School of Art (completed in 1909) by Charles Rennie Mackintosh for personal as well as architectural reasons. I first visited the building in the early 1960’s as a small child with my father who taught drawing and painting there. It sits on a steep hill and I remember us standing looking over the city below from the glazed loggia at roof level. I returned in the mid 1970’s as an architecture student at the Mackintosh School of Architecture and spent all my architectural education in and around it. It is a building of contrasts – simplicity versus decoration, large versus small spaces and dark spaces versus light airy spaces. It is both a landmark of early modern architecture and rich in traditional Scottish and art nouveau detail. 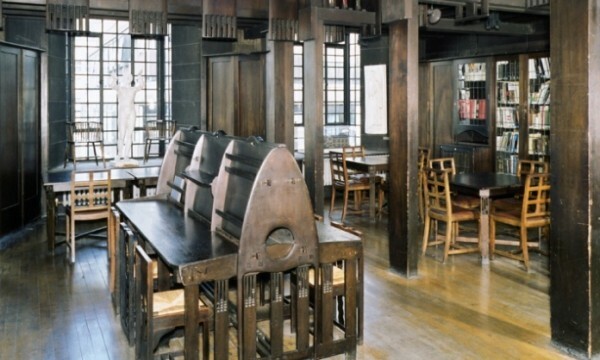 Mackintosh used the skills of the various tradesmen and craftsmen to add a level of decorative detail to a rational design making it a fine example of what can be achieved on a limited budget through imagination, the skills of all involved and the true nature of the materials used. The highlight for me is (was?) the Japanese inspired library with its intricate detail and exciting use of space, natural light and colour. Sadly when fire ravaged the building a couple of years ago the library was completely destroyed with only the masonry ‘shell’ into which it had been inserted remaining http://www.heraldscotland.com/news/13162087.Lost_in_the_fire__Mackintosh_library_has_gone/. After much debate the decision has been taken to rebuild the library exactly to Mackintosh’s original plans. Some think that this will constitute a ‘Mockintosh’ copy and that the school should instead install a contemporary design that reflects the present time. But it seems to me that since there will be sufficient detail to create an exact copy this is the right course of action to return this little gem to the city. On any project detailed drawings are produced and then one of multiple potential building / craftsmen teams is selected to build it. Here we will have a second team going through the process again from full information just over a century after the original construction. In fact, since the library was inserted into a masonry ‘shell’, couldn’t multiple versions be created for insertion into suitable ‘shells’ in art galleries or libraries throughout the world? If licenced, these could help cover the cost at the Glasgow School of Art and allow more visitors to enjoy this unique space. The Burrell Collection Gallery in Glasgow’s Pollock Country Park http://www.glasgowlife.org.uk/museums/burrell-collection/Pages/default.aspx was designed by Barry Gasson and Brit Andresen. It opened in 1983 and houses one of the greatest art collections ever created by one person – a unique collection of over 8,000 objects gifted to Glasgow in 1944 by Sir William Burrell. I have seen the construction equivalent of this. During the 1989 – 1993 recession, I was part of the architectural team that built the Glaxo pharmaceuticals research campus in Stevenage at a cost of around £500 million. It was generally held that this figure could have been around £100 million more had the work not coincided with the bottom of the cycle. I have seen the opposite as well – inflated construction costs – especially during the final months of 1999 leading up to the Millennium celebrations (remember the Millennium dome and it’s various themed zones?) when clients were obliged to pay ‘silly money’ to get things completed. Right now the market for construction work in the south east is patchy. Whilst there is plenty of work in London, where there are some skills shortages, in the wider south east prices have recovered since the ‘bargain basement’ prices that resulted from the ‘great recession’ that started in 2008 but there is still spare capacity. If the upturn in prices continues to roll out from London this year the pent up cost pressures in construction caused by years of cost freeze / cost reductions will continue to be released – though it remains to be seen at what speed prices will harden. Thankfully, from my point of view, there have been a few ‘Burrells’ about taking advantage of current prices. ‘I like complexity and contradiction in architecture’. The opening sentence of Robert Venturi’s timeless masterpiece is the most liberating sentence on the subject of architecture that I ever read because up until then I thought part of my job was to eliminate it. ‘Complexity and Contradiction in Architecture’ was first published in the USA 50 years ago in 1966 but it wasn’t until the mid 1970’s that the influence of the ideas that it contained had spread to the point where I felt compelled to invest a £4.75 of my student grant in my own paperback copy. Up until around this time my year group, and most of the architectural profession, expected to design in the pure white modernist ‘international style’ even though it should have been fairly apparent that it had run out of ideas and become a pale imitation of what it originally stood for. I remember doing a project for a white cubist yacht club at Gourock on the Firth of Clyde which was believable and almost contextual enough in a nautical kind of way but that was the last time I designed in that idiom. ‘Complexity and Contradiction in Architecture’ was the start of the ‘postmodern’ rebellion against modernism and for most of us it was a liberation from what was effectively a modernist design ‘straightjacket’. 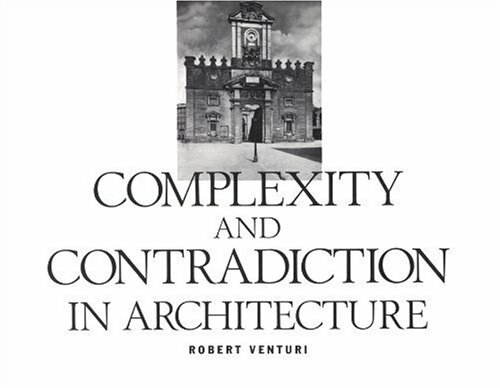 The above quotes are all from the first page – Venturi’s point of view being that architecture becomes interesting when complexity and contradiction are introduced. His arguments are developed throughout the book with the aid of three hundred and fifty architectural photographs which serve both as historical comparisons and to illustrate the act of creating and experiencing architecture. Whilst ‘postmodernism’ – the style that followed in the 1970’s and 80’s – came and went, corrupted itself by its often corporate paymasters and a lack of rigour (just as modernism was), later versions of ‘modernism’ were never the same. Today’s ‘contextual modernism’ (or whatever it’s currently called) owes a great debt to Venturi’s book. I re-read it and it has as much to say now after 50 years about resisting the easy orthodoxy as it had to say when it was first published. I watched Sharon White, communications watchdog Ofcom’s chief executive, on yesterday’s news which reported that, despite alleged underinvestment and poor access for rivals, Ofcom has stopped short of requiring the complete splitting off of Openreach from BT. Instead Openreach is to provide improved access to its infrastructure for rivals to lay their own fibre cables with the threat of a possible future break up if matters do not improve.